I hadn’t heard much from the band leading up to this release, but given their pedigree and the quality releases the Noyes has put out, lately I knew I’d be in to the record. If I was trying to blow you away with catchy phrases and hyperbole, I’d say something like “Action In The North Atlantic is full of riffs that are more angular than Tegan and Sara’s hair and more mathy than the extras from Saved By the Bell” but really, trying that hard cheapens the impact this record makes. The 10-song, 35-minute tour-de-force assaults you with sing/shouted vocals, heavy drums and huge guitar. From the first notes of Action in the North Atlantic to the last swirling, distorted tone of Position Fixing & Dead Reckoning, the band plays with an intensity that is missing from far too many of today’s bands. The title track – which I can only assume takes it’s name from the WWII book (and Bogart flick) detailing the contributions of the merchant marines – starts with thundering drums and familiar guitars and you can just picture the band freaking out on stage. The band members are so diverse, that the combination of sounds is pretty unique. Strike it from the Lexicon starts like a post-rock anthem before quickly switching gears and settling into a more DC sound. Munitions Ships is a perfect guitar freak out that builds tension and energy but the song transitions constantly over the 5-minutes, and each tempo change works nicely and sets you up for the spastic burst that is Low Level. I could go track by track and point out the goodness – the bouncy bassline that contrasts the noise of National Tectonic or the head nodding riff that dominates Dagger Woods - but every song on this record is executed perfectly. Without sounding dated, A History Of reminds you why the angular sounds that dominated the DC scene years ago were so addictive and explosive. 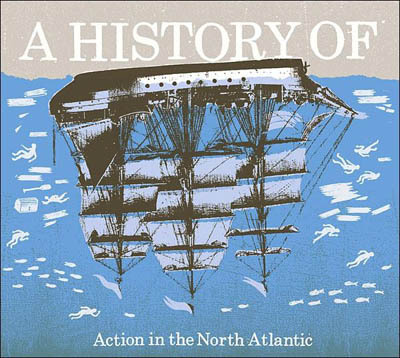 Action in the North Atlantic may be a historical tale a horrible time, but with the help of Noyes and bands like A History Of, it’s quickly becoming the mantra for the noise rock scene that is taking over Halifax.